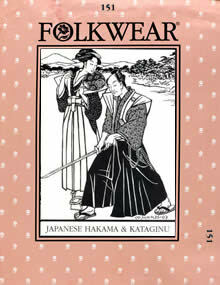 With the release of The Last Samurai, Tom Cruise's latest movie, patterns for traditional Japanese costume are in demand. 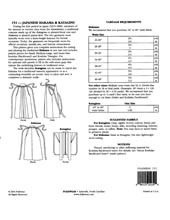 This pattern includes a measurement/cutting chart and sewing instructions for hakama, actual pattern pieces for the koshiita (blackboard) and koshiita triangles in three sizes, as well as pattern pieces and complete instructions for kataginu (pleated-front samurai vest). Both garments are traditionally worn over a knee-length kimono like our #129 Japanese Hapi and Haori or a shortened version of our #113 Japanese Kimono.